Andy Wilkinson set the UK 24 hour time trial record at 541.214 miles (871 km) on June 24/25 2011, so it would certainly take him less than a day. Maybe you’re that kind of rider. Give it your best shot and tell us about it. All you really need is a comfortable bike and the ability to pedal a bike for 40-60 miles a day. There are plenty of nice places to stay, and restaurants for every taste. Run minimal and use the local services. Find accommodation and food from people who support the Grand Illinois Trail Ride. Immerse yourself in Northern Illinois life in the best way we think possible. -On a bicycle. Loading up the bike racks, priming your stove and pitching a tent? We might have some information that will help you. Nine days is only one week off work, but give yourself 10 days or more and really explore Northern Illinois, and its bordering states: Indiana, Iowa, and Wisconsin. Doing a section or two each weekend might be the most rewarding way to do the trail because you see the trail and its surroundings on the weekends when the trail and the connecting cities are partying! 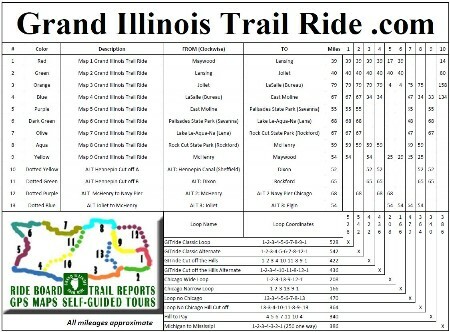 Calendar Savvy riders will have the opportunity to take in more of the festivals around the Grand Illinois Tail Ride if they limit their riding to a half-section or two on weekends.